I am not sure if I love Sheryl's fun firework cupcakes more because they are another great excuse to buy the fun push pops that have become so popular or because they are red, white, and blue for my favorite holiday! You can check out how to make these fun firework cupcakes over at Lady Behind the Curtain. 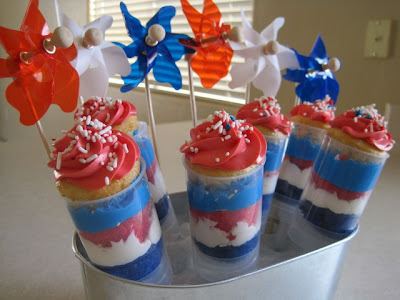 You so have to get some of these containers - the ideas are endless, but these will be a must do for my 4th of July Party - Thanks for sharing !!! I sincerely hope that there is as much frosting in those cupcakes as the picture seems to indicate. Mmm.